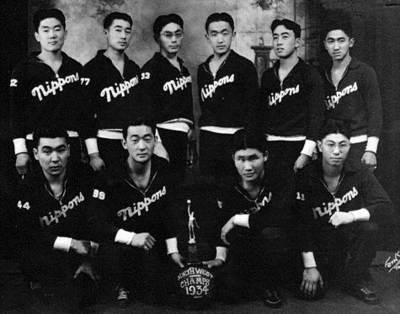 Athletic tournaments were important events for the Japanese community because they brought together Japanese from many areas of the Northwest. Pictured here, the Wapato Nippons display their 1934 basketball victory. Conferences sponsored by the Japanese Christian churches also brought young Nisei together for yearly conferences. The connections made at these conferences became valuable after the Pearl Harbor attack and the declaration of evacuation.